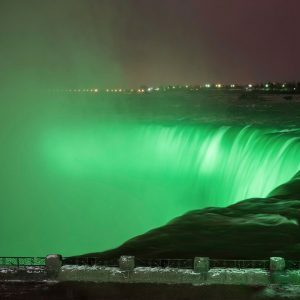 Horseshoe Falls illuminated in green lights for St. Patrick’s Day. This Saturday March 17th in partnership with Tourism Ireland’s “Global Greening” campaign, the Canadian Horseshoe, American, and Bridal Veil Falls will be illuminated in vibrant green lights in honour of St. Patrick’s Day. The illumination will be taking place from 9pm to 1am at the top of the hour along with a number of other iconic landmarks around the world including the Colosseum in Rome, Leaning Tower of Pisa, Sydney Opera House, and Empire State Building. Niagara Brewing Company on Clifton Hill will be celebrating St. Patrick’s Day this Saturday with great beer, live music, and Irish stew! Put on your green gear and get ready to celebrate with live music starting at noon and a live performance by the Danny Boys starting at 8pm. And along with awesome beer like a new American Pale Ale and the signature Niagara Premium Lager you can enjoy traditional Irish stew made with chunks of seared beef and vegetables stewed in a Hennepin Stout, served on top of delicious garlic leek mashed potatoes. Doc Magilligan’s Irish Pub on Lundy’s Lane is having a four day St. Patrick’s Day celebration starting on Thursday March 15th with a St. Patrick’s Day Kick Off Party and featuring a St. Practice Day event on Friday March 16th, St. Patrick’s Day on March 17th, and Irish Family Day on Sunday March 18th. Festivities will include live music all throughout the weekend, performances by Irish dancers, a full Irish menu featuring Corned Beef & Cabbage, Fish & Chips, and more!